Davenport Bed Size Dimensions range from the twin Davenport mattress at 36 inches wide and 72 inches long, to the full size Davenport mattress at 52 inches wide and 72 inches long, to the queen size Davenport mattress at 60 inches long and 72 inches wide and finally the queen XL Davenport mattress at 60 inches wide and 75 inches long. These are fairly standard Davenport size bed measurements. 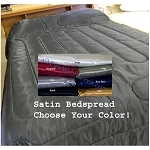 Davenport Mattress depths can vary from just a few inches to 6" or more. 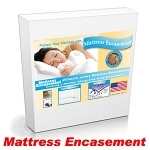 Many times, actual Davenport mattress dimensions will vary by one or two inches, usually smaller. Davenport specifically refers to a line of sofas once made by a popular but out of business manufacturer name the A.H. Davenport Company. The line of sofas they built were so popular before World War II that the name Davenport became genericized for sofa. Over time, up until current times, the Davenport came to mean a futon bed for sofa bed.